Apollo longed to obtain her; and he who gives oracles to the world was not wise enough to look into his own fortunes. He saw her hair flung loose over her shoulders, and said, “If so charming in disorder, what would it be if arranged?” He saw her eyes bright as stars; he saw her lips, and was not satisfied with only seeing them. He admired her hands and arms, naked to the shoulder, and whatever was hidden from view he imagined more beautiful still. He followed her; she fled, swifter than the wind, and delayed not a moment at his entreaties. “Stay,” said he, “daughter of Peneus; I am not a foe. Do not fly me as a lamb flies the wolf, or a dove the hawk. It is for love I pursue you. You make me miserable, for fear you should fall and hurt yourself on these stones, and I should be the cause. Pray run slower, and I will follow slower. I am no clown, no rude peasant. Jupiter is my father, and I am lord of Delphos and Tenedos, and know all things, present and future. I am the god of song and the lyre. My arrows fly true to the mark; but, alas! an arrow more fatal than mine has pierced my heart! I am the god of medicine, and know the virtues of all healing plants. Alas! I suffer a malady that no balm can cure! The nymph continued her flight, and left his plea half uttered. And even as she fled she charmed him. The wind blew her garments, and her unbound hair streamed loose behind her. 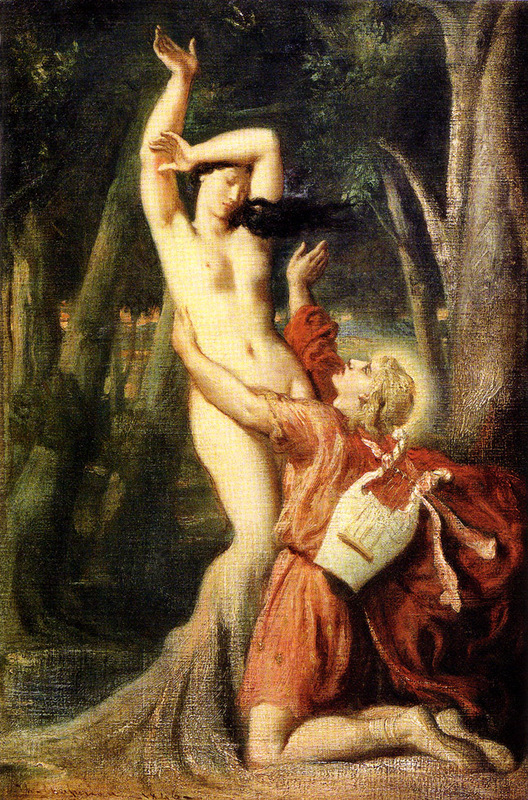 The god grew impatient to find his wooings thrown away, and, sped by Cupid, gained upon her in the race. It was like a hound pursuing a hare, with open jaws ready to seize, while the feebler animal darts forward, slipping from the very grasp. So flew the god and the virgin—he on the wings of love, and she on those of fear. The pursuer is the more rapid, however, and gains upon her, and his panting breath blows upon her hair. Her strength begins to fail, and, ready to sink, she calls upon her father, the river god: “Help me, Peneus! open the earth to enclose me, or change my form, which has brought me into this danger!” Scarcely had she spoken, when a stiffness seized all her limbs; her bosom began to be enclosed in a tender bark; her hair became leaves; her arms became branches; her foot stuck fast in the ground, as a root; her face became a tree-top, retaining nothing of its former self but its beauty. Apollo stood amazed. He touched the stem, and felt the flesh tremble under the new bark. He embraced the branches, and lavished kisses on the wood. The branches shrank from his lips. “Since you cannot be my wife,” said he, “you shall assuredly be my tree. I will wear you for my crown; I will decorate with you my harp and my quiver; and when the great Roman conquerors lead up the triumphal pomp to the Capitol, you shall be woven into wreaths for their brows. And, as eternal youth is mine, you also shall be always green, and your leaf know no decay.” The nymph, now changed into a Bay laurel tree, bowed its head in grateful acknowledgement. 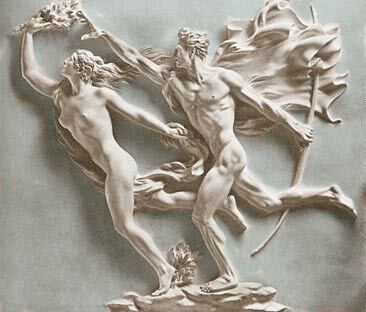 the Apollo and Daphne Tile Swap Puzzle in our Tile Swap Puzzle section.